I had not seen Christopher Nolan’s directorial debut “Following” in six or seven years, which made for the perfect excuse to drop 20 bucks on a ticket to tonight’s Slamdance screening and Q&A over at the Los Angeles County Museum of Art. The film holds up as a wonderful, if slightly obscure excerpt from that sensational year of cinema: 1999. It contains the seeds of a director’s fascination with broken narrative storytelling, borrows humbly from genre particulars already developed by David Mamet and Stephen Frears in years past (while turning them on their heads) and is a modest announcement of a significant new talent. Little did we know this unassuming director with a film rejected by Sundance would go on to helm one of the highest-grossing movies in film history. It’s a delight to listen to Nolan discuss the particulars of his craft today, with five other films under his belt and a lot of perspective to shine back on his initial cinematic foray. The narrative with Nolan has become, “He still maintains that independent edge even in blockbuster territory.” Yes, but it’s deeper, and yet simpler than that. It would be fairer to say he still maintains an understanding of lean storytelling (for the most part), even in the midst of dramatically ambitious stories. “Following” is a case study in that. And of course, the year-long filming process astounds me to this day, grabbing footage here and there on the weekends, the actors maintaining their appearance long enough to complete the project. Amazing. 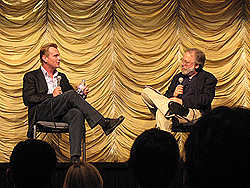 Nolan spoke an all-too-brief 20 minutes to the LA Times’ Kenneth Turan (who was double-checking his notes constantly) in front of a relatively diverse crowd, bringing in examples from his steadily expanding portfolio to emboss artistic points about his view of the filmmaking process. With Bat-hysteria flying off the rails this summer, it was a treat to listen in on a developing master’s serene take on the nuts and bolts of his art form. And that’s what it’s always about at the end of the day, no? Huh, I didn’t see you there Kristopher. Anyway, it was an awesome screening although I was hoping the Q & A would be open to the audience. I did witness some hillarious fanboy interactions with Nolan since I was sitting right next to him. One guy shook his hand for 2 minutes without letting go making Nolan very uncomfortable. So many creepy awkward approaches, people were even ironically following him out of the theater. Now there’s a weird coincidence — just this week I picked up a bargain-bin DVD copy of “Following” (Â£2! ), and was reminded of what a terrific little picture it is. More power to him for holding his own in blockbuster territory, though I’d love to see him do something more intimate one of these days.